Abraham Lincoln used to write scathing letters to his generals in the field, upbraiding them on strategy and tactics and whatever else was on his mind. Then he would lay the letters aside in a drawer, putting off the decision on whether to actually send them until the morrow. In most cases, the letters were never sent. I acknowledge your most recent dunning letter, dated October 22. This is the first one I’ve bothered to open. I only opened this one because October is about to end and I do not – and am not likely to – have your October mortgage payment before the calendar page turns. This is not a matter of forgetfulness. I don’t really need robocalls to my house each and every day starting on the 15th of the month advising me that “there’s been a change in the status of my mortgage.” Do you think I don’t know? Do you think I’ve forgotten? And why do you call three or four times a day? Do you think I'll forget between 9:00am and 8:00pm that I owe you money? I’ve been paying on this mortgage since 1996 – paying a little ahead each and every month, in fact. There have been months when I’ve been late before, and yet you’ve always gotten your money in the past. Including your late fees. You will get your money this time too – as soon as I get it. I am self-employed, Mr. Smith, and (unlike so many banks) when my customers don’t pay me – or when they take their sweet time in paying me – the Federal government does not provide me with large sums of cash to tide me over. I just have to wait. So, therefore, must you. I realize you may find this unsatisfactory. I’m not happy about it either. Perhaps you can take comfort in the fact that the Soulless Megabank is not alone in waiting for my receivables to mature into receipts: I have a drawer full of bills in the office and a desk full of bills at home, each of them with real and valid claims upon any funds that may straggle in. All will be paid as soon as funds become available – your October payment (as the oldest) first of all. If this provides inadequate assurance, please send me your home phone number so I can call your home three and four times a day, dinnertime included, and repeat this promise for you. I had a pension 30 years ago. I had it for two or three years and then the law changed. I don't know exactly why; I've never been a pension lawyer. As I recall it, though, the partners in my firm couldn't put what they wanted in their pension accounts without putting substantially more in each of their employees' pension accounts. So the pensions were all scrapped. I am pretty sure that they cashed us out when they killed the pensions: That chunk of change (sadly) remains the largest single piece of my retirement savings. We can talk about my poor retirement planning some other time. Today, though, I want to talk about pensions. I don't have one. I don't know anyone in the private sector who has one. My wife was enrolled in a pension plan when she started to teach full-time for the Archdiocese of Chicago -- but that plan was scrapped a couple of years later. They still take money out of my wife's check, but it gets invested in money markets and things like that, subject to the perils of market fluctuation. Public pensions are a sweet deal: For most public sector employees, at least here in Illinois, one need only put in 30 years and reach the age of 50 to pull a full pension -- a large percentage of your highest pay anytime in the four years preceding your retirement. Many school superintendents, for example, get huge one-time bonus payments on the eve of their retirements -- thereby greatly enhancing their pensions. My friend Steve, who pulled his pension earlier this year, was able to stitch stints with the City of Chicago and Cook County to reach his 30 years. And he was 'forced' to retire in that his boss cut his pay four years ago -- making it vital that Steve pull his pension this year or take a significant 'hit' in his pension payouts. A lot of the conversation among my contemporaries, when I was coaching at Bluejay Park, concerned pension issues. We were all turning 50. Most of the coaches had City jobs, or County jobs. But I didn't. And I have no pension. They've just changed judicial pensions in Illinois and a steady exodus from the bench has apparently begun as jurists pull their pensions. There is still a pension in place, but it is a thin and pallid thing, from what I'm told, over what there was before. But however wispy a weed it may seem to those on the inside, it is a California redwood to one such as me who has no pension at all. Anyway, pensions are a sweet deal for those who have them. But there is a teeny, tiny problem: The entities that are legally committed to paying these pensions -- state, county and municipal governments -- are broke. Unfunded or underfunded pension liabilities are frequently cited as the biggest single reason why local governments are in such bad shape. Thus, I make a modest proposal -- here in the relative safety of an anonymous blog, where I am less likely to be torn from my office by a torch-bearing mob of AFSCME activists and strung up from the nearest lamppost: End most public pensions. We have obligations to those who have, in good faith, done their 30 years and pulled their pensions. Honor those obligations. But for everyone else... just stop. No more contributions. If the folks with the sharp pencils say we can afford it, maybe we can reach back and continue funding pensions for those with 20... or 25 years' service already. Maybe. But for everyone else, we stop, just as pensions were stopped for me, my wife, and those of you (if you ever had one) who have worked only in the private sector. Public employees would get their proportionate share of the pension they'd earned before the switch, just like I got cashed out -- and my wife got a promise of (if I recall correctly) about $17 a month when she turns 65. I would make two exceptions: Police and fire. Not judges. Not legislators. Not public defenders or state's attorneys. Not attorneys general. Not employees of the Clerk of the Circuit Court or the Bureau of Electricity or the Department of Aging. Not even for teachers. Only for police and fire. And only because these are analogous to military units -- men and women who put their lives on the line on every shift. The guy who stamps papers with a red stamp or a blue stamp depending on whether all the rules were followed is not in the same position -- even if the occasional paper cut hurts like the dickens. This does not mean, I quickly add, that I would not happily accept a pension if, by some miracle, I ever did wind up on the bench. That's not hypocrisy; that's common sense. But we are in a budget crisis. I could save from a judge's salary if I had to. And so could all the other judges. Moreover, what one person does will not rescue the public pension system from ruin; I am suggesting a virtual abolition of public pensions to save the pensions of current retirees and rescue governments from their own generosity. The public sector might even be able to afford some sort of continuing contribution, like the Archdiocese is making in the case of my Long Suffering Spouse -- as long as these are not guaranteed benefits. The 11% contribution that a lot of public employees make to their pensions now could be diverted to that sort of program. Of course, this would put public employees at the mercy of the markets, too. Is this unreasonable? Am I being mean-spirited or reactionary? What do you think? ABC News is reporting that the probe that NASA recently crashed into the Moon splashed up a lot more water than expected -- enough that humans might be able to set up a base inside the crater with hot and cold running water -- all locally produced. Oh, sure, some of you were probably relieved to learn that the Mayan calendar may have been translated incorrectly and world might not end in late 2012 after all. But -- for me -- this was terrible news and yet another reason why I should never, ever plan. Time for an attack ad counterattack? My friend Steve has a theory about politicians. Someday, he says, medical science will progress to the point where a desire to enter politics will be recognized as a mental illness. As a one-time candidate myself, I've argued with Steve on this one. But I am beginning to think this may be the only explanation for the attack ads that are attacking all of us every night when we try to watch the news. At this point, I would happily choose a block of commercials for Viagra, Cialis and Flomax over any more commercials concerning Kirk, Giannoulias, Quinn, Brady, Halvorson, Kinzinger, Dold, Seals.... I could go on, but my stomach has started churning. We have early voting in Illinois -- people can cast their ballots today instead of on November 2 -- and I'd do it in a heartbeat if it would make the commercials and the robocalls stop. The cartoon at the top of this page expresses my feelings about this election rather well. To illustrate why, let's just look at one race, the race for Barack Obama's old seat in the U.S. Senate: Here, State Treasurer Alexi Giannoulias is running against 10th District Congressman Mark Kirk. The Republican candidate, Rep. Mark Kirk, is also an officer in the U.S. Naval Reserve and had been pretty well respected for his first-hand knowledge of foreign events. Then someone looked at his résumé. Although his record was honorable in and of itself, apparently Kirk exaggerated his military accomplishments. The extent of the exaggerations are lost in the fog of attack ads and, to a lifelong civilian like myself, this might not seem like such a big deal. But it is a big deal to people who have served: Consider that a former Chief of Naval Operations committed suicide in 1996, allegedly because it was about to be revealed that he did not have the right to wear "Valor device enhancements... on his Navy Commendation Medal and Navy Achievement Medal" -- two tiny bronze "V's" on a chest full of fruit salad. Kirk had been a liberal Republican, that term not always having been an oxymoron, but, in this election, in order to secure his party's nomination, he had to move to the Right on several issues. Thus, this guy plays fast and loose with the facts and with his beliefs in order to advance his career. The good news about the race for the U.S. Senate in Illinois? At least none of our candidates is a witch. I think we have to strike back at the attack ads, lest we all wind up as crazy as the politicians. I'm thinking of starting a fund to buy up airtime on all the local newscasts. We'd crowd out the attack ads with pictures of sunsets and mountain tops, waving wheat and soft, fluffy clouds, all set to a relaxing orchestral accompaniment. It might even calm me down enough to handle the latest sports news out of Halas Hall. We have an old house. It has an old roof. It was probably old when we bought the place and that's over 14 years ago now. Roofs wear out. I know it and insurance companies know it, too. But we had a tough Spring in Chicago this year. Tremendous hail storms. And roofers have been everywhere since, soliciting business. Someone even knocked on our door and talked to Long Suffering Spouse. He wanted to make a claim with our homeowners insurance company on our behalf arising from hail damage during one of the storms in April. Big hail storms, or wind storms or other disasters that affect a large number of people in a given area are called "cat losses" in the insurance business, "cat" being short for "catastrophe." Insurers assign extra personnel (the bigger companies bring in crews from out of state) to handle the claim volume. And even in this modern age, where insurers are able to print out estimates and sometimes even checks right from their cars in the ordinary course of business, the claim process may be streamlined still more when insurers are coping with a cat loss. As an insurance lawyer for 30 years, if I know anything, I know that property insurance only pays for things that may happen; it doesn't pay for things that must happen. The fancy legal principle is called "fortuity." Insurance companies generally don't buy new roofs for their customers just because the old roof has worn out. Thus, I looked at the roofing contractor prospecting for business with something of a jaundiced eye: It's an old roof, I thought. Past it's freshness date and then some, I thought. The adjuster coming to view the roof on the insurance company's behalf (and who has far more training in evaluating property losses than I) will no doubt arrive at this same conclusion and deny the claim. On the other hand, I had no chance of putting a new roof on my house now or in the foreseeable future on my own. The family exchequer simply would not support such a stupendous undertaking. So -- I thought -- let the young man try. He would, I was sure, roll snake eyes but, as with the lottery, you can't win if you don't play. I resolved merely to stay away from the process -- because nothing I could add would help my cause. And, sure enough, the roofer's first encounter with the insurance adjuster did not go particularly well. Yes, the adjuster agreed, there is hail damage. But it's an old roof. I can, he said, pay to replace shingles here, here and here -- and some siding, too -- but that's as far as I can go. This all sounded reasonable to me, and consistent with my own experience and training. But the roofer was not satisfied. I could do just the work the adjuster approved, he said, but lifting shingles here, here and here, will cause all the rest of the ones in between to crumble like dust. "Because it's an old roof, right?" I asked. "Exactly," he said, sounding a note of triumph that I did not think appropriate to the circumstances. Still, when he asked for one more opportunity to plead his case to the insurer, I did not refuse him. And thus, somehow, the young roofing salesman persuaded the insurer that nearly all of the roof had to be replaced. (The section over the 14-year old addition was not included, but, then, it was not nearly so old as the rest of the roof.) I suppose it is a function of replacement cost coverage: Having agreed that there has been a loss occasioned by a covered cause, the age of the property being repaired becomes essentially irrelevant. At least that's what I think the thought process may have been. But, as I said, I'm not asking questions. Keeping my mouth shut, for once, got me a new roof. Perhaps I should be quiet more often? Do you know why they call it the 24-hour flu? Because that's the most time that anyone can devote to an illness that is not completely crippling in today's ridiculous world. Oh, sure, if you have a heart attack or cancer or get run over by a bus, people are willing to give you a little more slack. But for the garden-variety, creepin'-crud-type illness that fells us all a couple times a year, 24 hours is all you get, brother. You'd better be up and at 'em promptly by hour 25. Tuesday afternoon I felt myself sinking into a viral funk. Nothing exciting -- merely that I lost the ability to perform the simplest tasks. Writing the simplest letter was beyond my capabilities. Printing an envelope would have been impossible. I struggled with Free Cell. Finally, I realized that I should just pack up and go home. I put together a bunch of stuff I could do from home if I felt up to it in the morning. In the end, I didn't even move the daily backup files from my memory stick. In fact, my signal accomplishment yesterday was turning on my cell phone -- so that when my one paying client did call in the afternoon, I could tell her I wasn't in the office and wasn't feeling well. She hung up quickly. A thousand miles away, over the phone, and she acted like she was worried she might catch something from me. And I don't blame her. After all, there's no slack given for the minor ailments that slow us down from time to time. It wasn't an entirely restful day at home. We had a new roof put on most of the house yesterday. (How we got a new roof is worthy of a post in and of itself, so I'll put that up next.) The point here, however, is that, with roofers running around, there would be no napping. When the roofers knocked at the door, I had to figure out where they could plug in their equipment. In my fuzziness, I thought there was a plug outside, on the front of the house. (But, no, that was the old house.) After thinking awhile, I was pretty sure there was an outside plug, though, and I found one on the side of the house -- but I'd forgotten that it didn't work. Eventually, I found working plugs inside the house and got their equipment going. I proudly reported this achievement to Long Suffering Spouse when she called to check up on me at lunchtime -- and she promptly told me I was wrong. Didn't I remember that we'd talked about setting them up with the outlet inside the garage? (No, I didn't.) A few more questions along these lines -- and a few more non-responsive answers on my part -- and Long Suffering Spouse hung up on me. I had the effective IQ yesterday of a coffee cup. An empty coffee cup. The excitement of the roofers notwithstanding, mostly I watched old movies that I'd put on the DVR and played a computer game and dabbed at my nose. Later, I finished a book I'd started over the weekend. I can't really be sure whether I even enjoyed the movies. Whether I'm really so much better today is, I suppose, for the reader to decide. Four Fridays ago, Youngest Son angled across the middle of the field from his wideout position just past the first down marker. The pass was thrown his way, but high, and Youngest Son had to jump to snare it. He did -- and was rewarded for his effort by being clobbered by a mob of defenders. "Ooooh," said the fans on our visiting sideline. "Ooooh," said Long Suffering Spouse, and with considerable feeling, I might add. "At least he held on to it," said one of Youngest Son's brothers. Oldest Son and Middle Son were both in attendance. Older brothers are a tough audience. Youngest Son stayed in the game and caught another pass but, though the game was competitive until the final minutes, Youngest Son's team lost. Sunday, after Youngest Son returned from Mass and film study (it is a Catholic school) I asked what he had learned from watching the film. "I learned I caught a second pass," he said. "I didn't remember that." "Ooooh," I said. "Maybe we shouldn't mention this to your mother." We were in the den -- with the TV on and the volume pretty far up. My son and I were speaking in hushed tones. Nevertheless, from the kitchen came a female voice, "What shouldn't you tell me?" The following week the team went to the far southern suburbs for its Friday night game. Traffic in the greater Chicago area is almost always miserable, but it is never quite so miserable as it is on Friday night. So Long Suffering Spouse and I did not arrive until the middle of the first quarter, with Long Suffering Spouse reminding me with nearly every breath that our being late was entirely my fault. Which, of course, it was. We took our seats on the visitors' sideline and looked for Youngest Son. When the defense is in, Youngest Son can usually be found standing next to his quarterback or to one of the coaches. We didn't see him right away because he wasn't standing where he usually does. We noticed also that he wasn't on the field as often when our team had the ball: He was out there, yes, but they were substituting for him regularly. What we missed in those first few minutes of the game was Youngest Son's reception over the middle. Once again, he'd been creamed by a swarm of defenders -- and driven into the turf. As he explained later, when he came off the field he found a teammate who he thought might know and asked, "Quick, tell me: What is the trainer going to ask me?" The trainer found Youngest Son soon thereafter and asked his questions and Youngest Son (having boned up in the manner described) answered them correctly. The trainer cleared Youngest Son to return to the field... but it was clear, at least in retrospect, that neither he nor the coaching staff thought that Youngest Son was entirely unaffected by the hit. "Well, this proves you have a brain, son," I told him, "because you've managed to injure it." No, neither Robert Young/ Jim Anderson nor Hugh Beaumont/ Ward Cleaver would have used that line. But we had what seemed, at the time, to be a good discussion about the need for candor in disclosing and assessing injuries. And the Mohawk haircut he got for the following week's big rivalry game was not, in my opinion, related to the brain injuries of the preceding weeks. That was simply the product of the normal, underlying teenage brain damage that Bill Cosby used to talk about. So, last week, as we went to Youngest Son's game in the western suburbs (and, despite my getting a late start, having come from a wake, we got there before the opening kickoff), Long Suffering Spouse and I were operating under the assumption that a new era of openness in parent-child communication had dawned between us and Youngest Son. As we walked into the stadium, though, the athletic director's assistant buttonholed us. "Is your son feeling better?" she asked. "He was really hurting this week." "No, he seems fine," Long Suffering Spouse said, "he's fully recovered." But Long Suffering Spouse thought we were talking about the head injuries... and so, I suppose, did I. We noticed, however, that, once again, Youngest Son did not play as much as he might have. There was another player running his route on a touchdown throw. Youngest Son did have two receptions, though, and the team won big, and a lot of people got to see the field. But, still, I thought I'd better revisit the injury issue with him on Sunday after Mass and film study. "Oh yeah," Youngest Son said, "my back was killing me during the week. I'd get my reps in on offense and Coach would send me to the locker room to ice it." I asked him how his back felt on game night. "I was fine," he said. "After my first catch, Coach called me over and asked me the same thing. And that's what I told him." He was quiet for a moment. "I don't think he believed me, though." Long Suffering Spouse later found the heating pad in Youngest Son's bedroom. The good news? The season is almost over -- even if, as a big part of me still wishes, the team goes deep into the playoffs. Young people see themselves as immortal -- which is, oddly enough, why they do so many reckless things and sometimes die in the process. There's a reason why we send young men off to fight wars: They don't really know (until they get there, at least) that they might actually get killed. As we get older we find out that we are mortal after all. I had a call yesterday morning from one of my ex-partners. He called to tell me that someone we'd both worked with at the old firm had just dropped dead. The guy who died was just a year ahead of me in school. When he passed the bar, I replaced him as the law clerk. When he left the firm (in an argument over his partnership agreement) I tried to leave with him. He wouldn't take me. I didn't leave for several years thereafter. This guy who died set up his own firm and had done fairly well. Unlike me, he actually grew his firm to the point where he had minions -- associates and staff. After I went out on my own, he tried on more than one occasion to throw a little business my way. I called him a couple of times with questions in his specialty (worker's comp). We'd run into each other on the street and chat amiably. We exchanged Christmas cards. We weren't close friends, but we were friendly. And then, yesterday, after breakfast with his wife, he went back upstairs to get something from his room that he'd forgotten. He never came back downstairs. He was gone -- just like that. After court this morning, I checked to see if the obituary was yet on line. It is. So I wasn't "punk'd." I'd held out a sliver of hope that it might be just a stupid, cruel prank. I've long understood that "kids my age" might get a wasting disease and die. I know too many who did. I came too close to that one myself. But "kids my age" aren't supposed to just drop dead. Especially ones that I know. And that I remember best from when we were both a lot younger. Can a person get a "contact hangover?" I assume that many of you will be familiar with the expression "contact high" -- not from experience, of course, but, rather, from your wide and deep reading in American culture. Middle Son had heard of that concept, but he had not seen how it might work until one night, a few years back, when he ushered a Rolling Stones concert at Soldier Field. Many of the concertgoers were smoking cigarettes in which tobacco was not an ingredient. What particularly surprised and alarmed Middle Son was that many of these same concertgoers were clearly as old as -- or older -- than his own parents. But today's essay is not about "contact highs." It goes back, instead, to last week when, as you may recall, Younger Daughter celebrated her 21st birthday. I mentioned at the time that all my kids of legal age (and Hank and Abby, my son-in-law and daughter-in-law) decided they would take Younger Daughter out for a celebration after Youngest Son's Friday night football game. All were gathered, then, in my living room, after the game. It was nearly 11:00pm. I was standing up only because, if I sat down, now that I was safely in my own house, I would surely go right to sleep. Abby, I noticed, was nodding over on the couch. Oldest Son, her husband, said he was feeling tired, too, and therefore needed to start drinking. Older Daughter and her husband Hank weren't saying much -- but, then, they'd driven up from Indianapolis already today. They certainly looked tired. I made a suggestion about getting a quick one in the neighborhood and calling it a night -- but that plan was swiftly voted down. Eventually, with the costuming issue resolved, the group left. There was one further debate, about whether they should take the family van or whether they could all fit in Middle Son's car. There would have to be two lapsitters in his car (they were picking up one of Middle Son's friends en route) but Middle Son's car would be easier to park in the Lincoln Park area, where they were headed. We expected Older Daughter and Hank to return, and Younger Daughter, of course. But, on the way out, Middle Son advised he'd probably be coming back to the house as well. I suggested it might be easier if everyone stayed in the City -- Oldest Son's apartment is small... tiny, even... but bunking there might be better, I thought, than trying to navigate the roads after this late night frolic. My suggestion was considered -- and rejected. In a cab, via Taco Burrito King. Taco Burrito King -- or TBK, as it is more colloquially known -- is the after hours place to go for today's Chicago Nocturnals. In my day, it was either White Castle or some place called Dewey's (that I never actually saw) where one would get "a bowl of red" (chili) or "a bowl of red with eyes" (chili with two fried eggs on top). Personally, back in my drinking days, I never saw much virtue in mixing food with my liquor. But that was a matter of personal taste. Many people -- my kids included -- like to end a spree with a meal. Thus, TBK. Anyway, I heard noises around 5:00am. "Who's there?" I hollered. There was no reply. I heard more noises, put two and two together, and went back to sleep. I slept in on Saturday, in deference to my houseguests. I managed to stay in bed until 8:00am or so. By mid-morning, nearly all of the Nocturnals had awakened, to one degree or another, and were regaling me with tales of their grand adventure the night before. It's the kind of stuff you've all heard before: Shots of various liquors, beer pong, transvestites posing for glamor pictures on the stairway in a bar.... I won't bore you with the details. But as the stories went on and on, I began to feel worse and worse. And, so, it occurred to me: Can you get a contact hangover? Because I think that's what happened to me Saturday. * I wish to stress my approval and appreciation of the cab idea. Oldest Son brought the car back later Saturday. Summer morphs into Winter overnight in Chicago, then weakly back to Summer, then back to Winter (its grip tighter this time). Fall, if it comes at all, may last a day or two or even a few hours while the dominant seasons decide which will rule the day. The seasonal struggle has begun now in Chicago and, at the Curmudgeon home, after a couple of mornings of teeth-chattering, we grudgingly conceded that it was time to fire up the furnace. We have gas forced air heat in our home, just as in every other home I've lived in over the years (student apartments with alleged steam heat don't really count). The smell of the furnace kicking in for the first time triggers something pleasant for me -- happy memories, perhaps, of the security of childhood? On the other hand, the start of heating season means the ballooning of the gas bill. The more rational, less sentimental Curmudgeon that I've become wants to put this day off indefinitely for obvious reasons. But -- yesterday -- we decided that the furnace must be started. Long Suffering Spouse and I put in the new furnace filter and I scraped off some of the accumulated crud inside the machine. Ours is an elderly furnace. It was venerable when we moved into that house, now almost 15 years ago. The furnace contractor was trying to talk up a replacement from day one. We know we are on borrowed time. But new furnaces are the kind of luxury that must await the end of the tuition cycle -- and, for us, that's 2015. Unless, of course, the world ends in 2012 like the Mayans warned.... What a waste it would be to get a new furnace if things were to work out that way. We made sure the covers were properly placed and I went upstairs dial the thermostat down to 68 (it had been on a much higher temperature, of course, for air conditioning). I threw the switch. There was a noise... BOOM!... and, then, a shout: "Turn it off! Turn it off!" Long Suffering Spouse reported that the furnace cover flexed as the force of the explosion pushed it outward. A sheet of flame erupted beneath the hatch cover. She feared for a moment that a fire was about to start. Or at least most of it -- she's going out with all her of-age siblings tonight. The whole bunch are gathering to attend Youngest Son's football game tonight. Youngest Daughter's actual birthday was Monday. As a father, I get particularly nervous around these 'milestone' birthdays: Too many kids overdo the natal day festivities to the point where they make themselves seriously ill. Occasionally, some die. Having a lot of friends is a good thing. Having a lot of friends buying you shots is a bit more problematic. Long Suffering Spouse was grading papers Monday evening, as usual, when her cell phone went off. Younger Daughter was calling. Somehow Younger Daughter had Tuesday off from school. The whole campus did (I looked it up). It wasn't closed for Younger Daughter's 21st birthday; I can't remember the actual occasion. But it certainly was convenient for Younger Daughter's purposes. Younger Daughter's purposes involved the legal purchase (for once!) of stimulating beverages. She was in the Jewel closest to the school, pacing through the Liquor Department, and she needed a mother's advice. 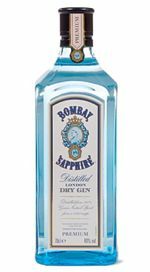 "What's Bombay Sapphire?" Younger Daughter asked. My wife knows a great deal about a great many things, but she has never made a particular study of potent potables. So my wife repeated the question for my benefit. Long Suffering Spouse had put her phone on speaker, but she still had to repeat the answer for Younger Daughter's benefit. "Gin?" Younger Daughter asked. "What's that?" "I don't much care for it," I said. "Well, it's a really pretty bottle," Younger Daughter said, "and blue sapphire is my birthstone. I think I'll get it." "Good luck," I said -- and left it to my wife to make all the admonishments about being careful and not getting sick and so forth. The call was promptly terminated. But, apparently, Younger Daughter wasn't done. Olaf was with her, of course. Olaf is not just her boyfriend, he is her loyal chauffeur (it may not have been too far to walk to the Jewel but the burdens would have been too heavy to make the return trip on foot). Moreover, Olaf -- we found out later -- rather likes gin. Or at least he did. One of Younger Daughter's best friends from grammar school was also along for the expedition to the grocery store. They were apparently making no secret of the purpose of their expedition and the reason therefor. In the movie version of this story, there will be an increasingly large number of people, young and old, attaching themselves to Younger Daughter and her friends as they wander up and down the aisles making their selections. Some would offer advice. By the time Younger Daughter gets to the checkout lane, the entire store will be in tow, cheering her on in Capra-esque fashion and calling out birthday wishes as Younger Daughter makes her exit. My mental reconstruction of the scene may be a bit much -- but Younger Daughter did tell me later that "the whole store was cheering" for her as she completed the transaction. Younger Daughter and her friends went back to the dorm for "pre-game" -- putting away a significant amount of the newly-purchased booze there so as to hold down the later bar tab. Because, after a sufficient time, the birthday party, increased now by various hangers-on from the dorm, adjourned to the fleshpots of Madison Street. Middle Son looked in on the happy group at some point later on. He noted they were too happy to get home on their own, so he got Olaf, Younger Daughter and her other friend safely back to the dorm. "And Olaf didn't throw up in my car," Middle Son said appreciatively. "I made him keep his head in a bag, though, just in case."